Proto-PLCC is a 4" x 4" SMD and Through hole breadboard, used to design and build up any type of 20 to 52 pin microprocessor, or controller circuitry, using SMD socket, or direct solder to board. There are 4 SOIC pad areas, with space for 32 pins (2-16 pin chips) of logic or interface on each of the areas. They have micro-pads for connecting wires to the SOIC legs, and can use either the narrow(0.150") or wide(0.300) SOIC packages. 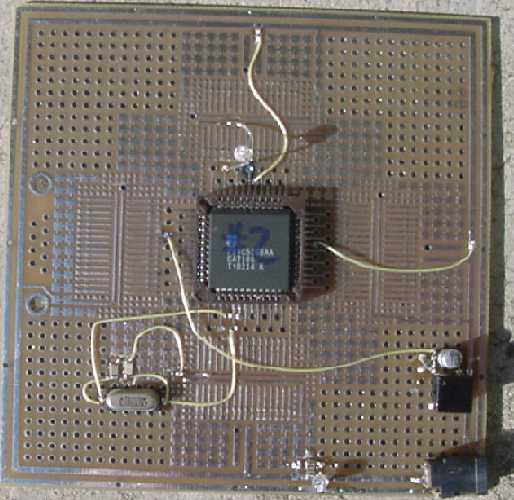 There are the Proto-Chip pads, for adding discrete and passive parts like 0603-1206 caps, resistors, crystals, inductors, transistors, diodes, SOT-23 devices, or leaded parts. Use them for extra wiring pathways, ground/power bus and shielding. They are wired together, just lay out your circuit, and cut away the traces not needed, to wire up a majority of your circuit(s). Helps out with the wiring and soldering agony of stripping 30 gauge wire, and soldering it onto the end of a 0603 part!! A DB-9 connector location, for putting in RS232 or other communications interface to a mounted connector. Power and ground traces around the board edges, and between each SOIC pad area. Ground plane on back side, with soldermask now! Test point through hole pads for all 52 pins. 4 separate areas for DIP's or other through hole parts. Space enough for 24 pin EEPROM size parts in each corner of the board. Great for building up an 8051, or 68HC or any other micro or controller that comes in a PLCC package. Put in the support chips, memory, and interface on 1 breadboard, not using many smaller boards. Great for school or any engineering project that uses a 20 to 52 pin PLCC package. 2 colleges now use this for their computer design courses, robotics and industrial controllers. See some pix on the main page and customer boards page, coming soon! These are designed by an engineering type, for engineering types and treat it like a protoboard! I know it is nice looking, but if you have to chop it in pieces, so be it. The Original Proto-Chip is one that could be cut in half, and be 2 separate mirror halfs. The Proto-Chip n' DIP2 is similar, cut off DIP side, or, cut it length wise for 2 boards, one is SOIC, the other is fine pitch parts. Don't be afraid to use more than 1 pad or trace to solder to. I put 1206 parts on their side and go across 2 or 3 0.65 mm traces to fit across a MSOP Op Amp on both sides for feedback R. Be Creative! Thats why I designed them, and tried to make them usable for prototyping, not just being an "adapter board". Those are everywhere, I am trying to build circuits for projects, rework SMD modules, and other things not possible, with a 0.1" DIP board or an "adapter". As one famous line from a Clint Eastwood movie, "IMPROVISE, ADAPT, OVERCOME". It seems that SMD parts are the improvization, the DIP boards were what we had, we are now adapting to the new way, and with Proto-Chip SMD breadboards maybe we can overcome the problems, building with SMD parts!